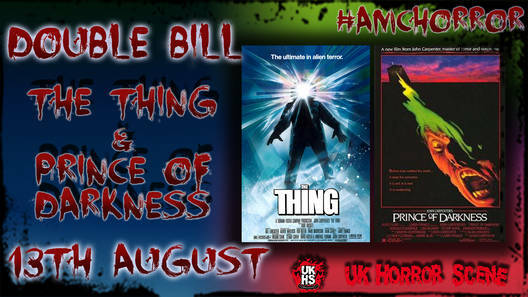 Starting off on 13th August at 19:00 will be John Carpenter's The Thing (1982). This classic stars Kurt Russell and takes place at a remote Antarctic research base where a shape shifting alien being creates a sense of paranoia and horror. Next on this night at 21:10 is Prince of Darkness (1992); another John Carpenter film that shockingly I had never heard of or seen. The following week on 20th August we will be treated to Evil Dead II (1987) which finds Bruce Campbell trapped in a cabin with a bunch of deadites, as well as his severed hand trying to kill him. This is followed of course by Army of Darkness (1992); the third in the Evil Dead trilogy and the weakest one, though it does have it's moments. 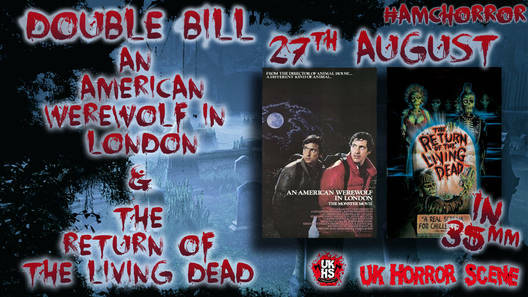 27th August see John Landis's An American Werewolf in London (1981). I'm not keen on the werewolf genre at all though this is one of the better ones. After this comes Return of the Living Dead (1985); a great and hilarious zombie film that I heartily recommend. In September and on the third of that month the double bill is made up of moody brooding horror The Crow (1994) starring Brandon Lee in his final role as a being from beyond the grave seeking revenge for his and his girlfriends murders. Followed by The Lost Boys (1987) which I loved as a kid but have not seen for a very long time. September the 10th is Guillermo Del Toro's Pan's Labyrinth (2006), a stylish horror fantasy about a girl who discovers a creepy secret world. Soon after comes Deep Red/Profondo Rosso (1975) which is one of Dario Argento's many giallo films and meant to be a classic of the genre. Nearing the end of the event on September 7th there is A Nightmare on Elm Street (1984) which of course is about Freddy Kruger haunting the dreams of teenagers. Afterwards is Invasion of the Body Snatchers (1978). This tale has been told on film many times but I reckon this Donald Sutherland version is the best of the lot. The final week of this event is September 24th and has some newer films that are made up of Zombieland (2009); not a bad zombie film in the slightest, and Attack the Block (2011) which I have never seen, it is about aliens attacking a block of flats I believe. Anyway so that is the list, these films all cost £4 each to watch and if you want to book in advance then visit the AMC website here. It is awesome that such classics are being shown once again on the big screen, I just wish I lived closer so I could attend some of these!